It's officially 2014! Happy New Year! Hard to believe 2013 has come and gone already. Did you make any goals or resolutions for 2014? I know I did! I going to try to be better about remembering family birthdays and send out birthday cards or something along those lines. To me, a quick Facebook message just doesn't cut it. Sending a card shows someone you care and took effort into thinking of them, which I think is really special. As technology advances, I believe we lose sight of some of the more meaningful things in life, like recognizing someone's birthday. Another thing I plan to do is to put more effort into celebrating holidays. With being in college and being away for nursing school, I was really bummed that I didn't get to do the fun things like carve a pumpkin or decorate a gingerbread house. 2014 is going to be the year of celebrating the special days in life! I couldn't imagine my life without this pup and if you told me this time last New Year's Day I'd be the mama to a monster 90 pound pup like this one, I wouldn't have believed you! 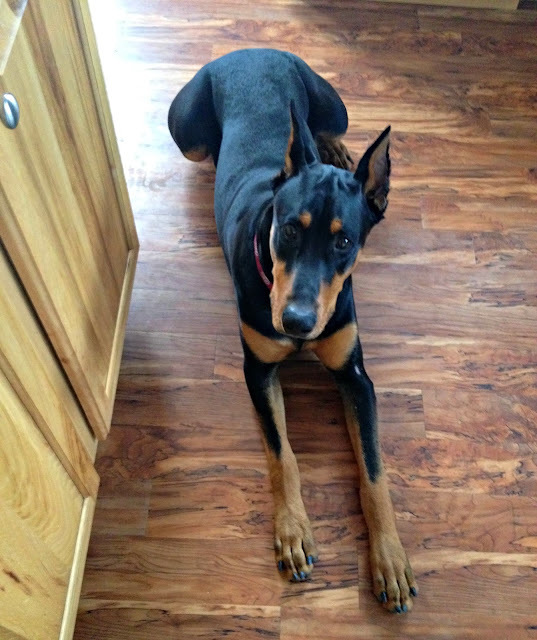 Duke has officially become my sous chef. He is either laying on the floor besides me hoping I'll drop something or standing right beside me trying to sniff everything. Just like his mama, he has a deep appreciation for good food. You should have seen him going nuts when I was making this fun breakfast. The smell of sausage was making him go crazy! Dusty absolutely loves pigs in a blanket for a quick dinner. Just grab some hot dogs and a can of croissant dough from the grocery store and you are good to go! I thought this would be a fun twist that could be enjoyed for breakfast we would both enjoy. Plus, what a great breakfast item to make for a kids slumber party the next morning or a brunch/breakfast gathering! They are super easy to make and you can make as little or as many as you want. 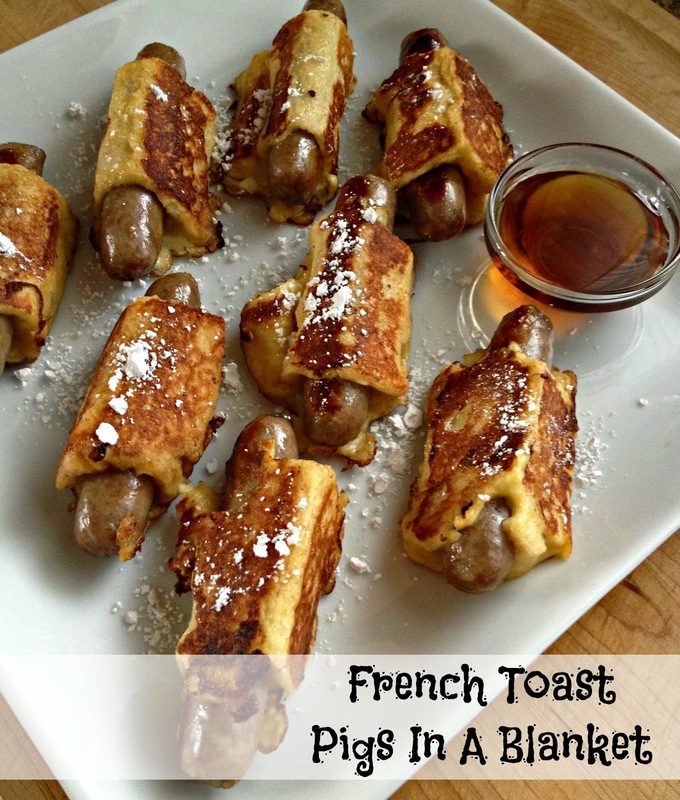 If you love french toast and you love sausage (who doesn't??? ), you will love these French Toast Pigs In A Blanket! Preheat the oven to 375 degrees (F). Line a baking sheet with parchment paper or silicon mat, and place the sausage links on the baking sheet. Bake the sausages until lightly browned and cooked through, about 10 minutes. Remove from the oven and set aside. In a large bowl, whisk the eggs, milk, sugar, cinnamon and salt together. Cut the crust off the 4 slices of bread and trim each slice into two 2x4 rectangles. Using your fingers, slightly flatten the bread and then roll each pieces of bread around a breakfast sausage, pinching or pressing to firmly sealing at the end. Transfer the sausages to the egg mixture and soak them for 2 minutes. On an electric griddle or skillet, melt the tablespoon of butter over medium heat. Add the pigs in a blanket and cook for about 5 minutes. Turn the sausages intermittently to make sure all sides of the pigs in a blanket are cooked through. Serve with powdered sugar and warmed maple syrup. Enjoy! *If making larger quantities, make sure to cook these in batches. Decrease the oven temperature to 200 degrees (F) and place each batch on a baking sheet in the oven to keep warm. Thank you Anne! 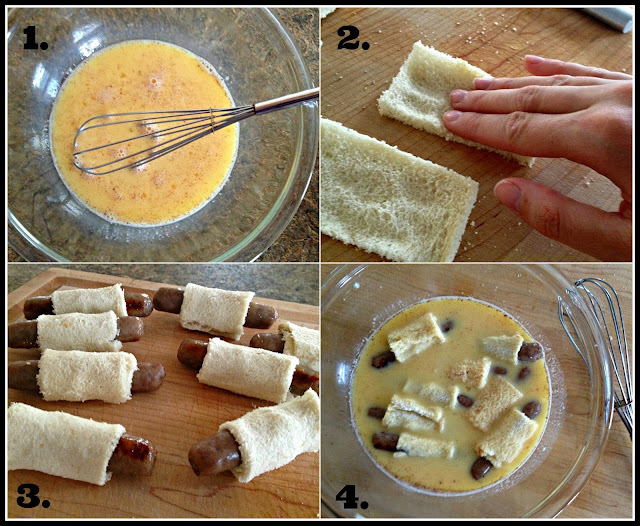 These pigs in a blanket are so much fun to make and they are just as fun to eat! Now I KNOW that my boys would love this for breakfast! What a fun idea. 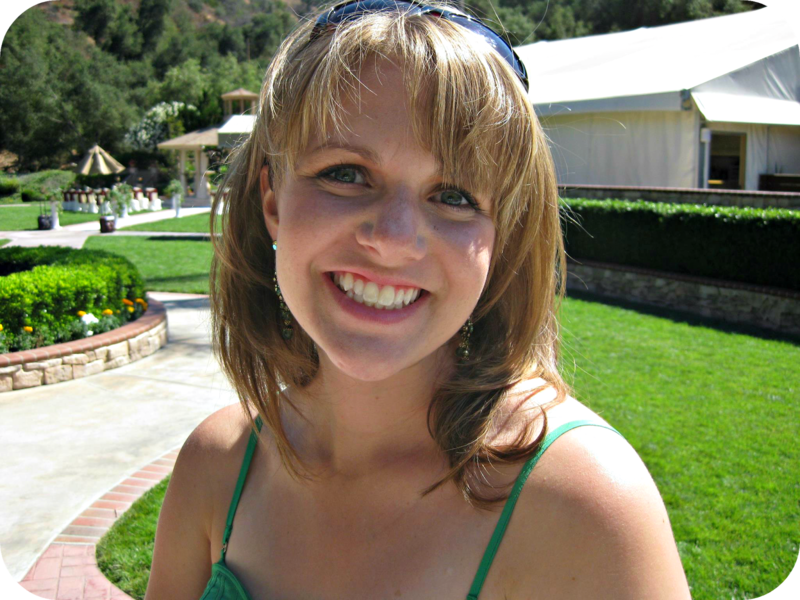 I'm an beyond thrilled for all that you've accomplished in 2013. May the coming year be even better! You gotta make it for your boys! They will love these! Made these again just now, AWESOME again! This time I put a poached egg on top of them, and syrup. I am speechless, thanks again!